The American cleric who delivered the sermon at the wedding of Prince Harry and Meghan Markle this spring is in Iowa this weekend. Presiding Episcopal Bishop Michael Curry said the wedding gave him a wonderful chance to talk about the core of the Christian faith to an audience he wouldn’t otherwise have reached. 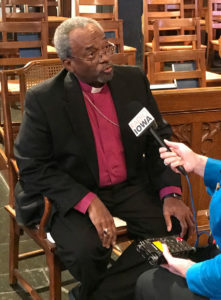 Curry was elected primate of the Episcopal Church in 2015. He will address the annual convention of the Episcopal Diocese of Iowa on Saturday. Curry predicts “mainline” protestant churches are heading toward a realignment. Rather than focusing on houses built exclusively for worship, the bishop suggests the rebranding may lead to creating tight-knit Christian communities through meetings in homes, which was how the “Jesus movement” started centuries ago. “Because Christianity is so old — it’s been around a long time — it’s very easy to let some of the trappings that have been added on begin to identify what Christianity and what being a Christianity is all about, rather than going back to the actual core essential: the spirit and the teachings of Jesus of Nazareth,” Curry said. There are 59 Episcopal congregations in Iowa, with nearly 8000 baptized members. Curry spoke with Radio Iowa early this afternoon in the main sanctuary at the Cathedral of St. Paul in Des Moines.